The First Dodrupchen Rinpoche Jikme Trinle Özer (Tib. འཇིགས་མེད་ཕྲིན་ལས་འོད་ཟེར་, Wyl. ‘jigs med phrin las ‘od zer) (1745-1821) was born in the Do valley of Golok, and from childhood onwards had many pure visions and displayed extraordinary signs. The ceremonial cutting of his hair was performed by the second Shechen Rabjam Rinpoche, Gyurme Kunzang Namgyal (1713-69), who gave him the name Kunzang Shenpen. He received teachings from about twenty lamas, including the third Dzogchen Rinpoche, Ngedön Tenzin Zangpo (1759-92). Following Dzogchen Rinpoche's instructions, he carried out a seven-year retreat at Upper Gang-Trö, near Dzogchen Monastery, during which he was helped by the Protectress Tseringma. Dzogchen Rinpoche also prophesized that the master with whom he had a special relationship by virtue of his past karma, and who would figure as his principal teacher was the great vidyadhara Jikme Lingpa. So at the age of thirty-nine Dodrupchen Rinpoche travelled to Central Tibet and met Jikme Lingpa at his residence at Tsering Jong monastery in the Yarlung Valley. Jikme Lingpa recognised him as the future holder of his teachings, as had been foretold by Guru Rinpoche. He later became the spiritual teacher to the Queen of Derge and her son, founded a number of monasteries, including his seat at Yarlung Pemakö in the Ser valley, and spread the Nyingtik tradition in Amdo and as far as the Kokonor region of Mongolia. A 'treasure revealer' (tertön) who discovered his own mind terma, Dodrupchen Rinpoche was recognised by Jikme Lingpa as the incarnation of Prince Murum Tsenpo, a son of King Trisong Detsen. 'Dodrupchen' literally means 'The Great Siddha from Do valley'. Amongst his disciples were the greatest Dzogchen masters of the time: the Fourth Dzogchen Rinpoche Mingyur Namkhé Dorje, Do Khyentse Yeshe Dorje, Gyalse Shenpen Taye and Dola Jikme Kalzang. 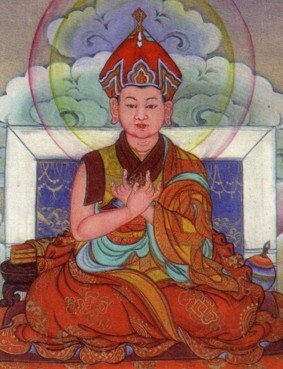 He blessed Patrul Rinpoche (1808-87) as a child, made prophecies concerning his future eminence and gave him his name. This page was last edited on 16 February 2018, at 09:55.